Here is the new stencil taped to the wall, you can really see the size, I believe the finished design is 32 by 32. I used a stencil level when I did the bathroom ceiling, but yet to use one for a wall. And here is why, if your ceiling is not level then the gap at the top will not be off as compared to ceiling and to me look funny, so I "assume" the ceiling, or in this case the picture rail is level, and use the concept of visual level. If your stencil is always flush with the ceiling than it will look level in relationship to the ceiling. It's always seemed to work for me. Here is one of my, hindsight is 20/20 pieces of advice, I would cover most of the plastic of the stencil with painters tape and just leave about an inch or less around the cut off of the stencil. Why you ask? Simple - it makes it that much faster and easier to clean. Just peel the tape. So if you cover most of the stencil with painters tape, you will thank me as you are scraping dried paint off the edges. The key to a good stencil line, the less paint the better. I know what is what everyone says but its true. I like to use a full size paint tray and roll off the extra along the groves. The picture below is from Sarah M Dorsey's blog. If you notice her stencil has more of a depth in the shades of color. She used a stencil brush. 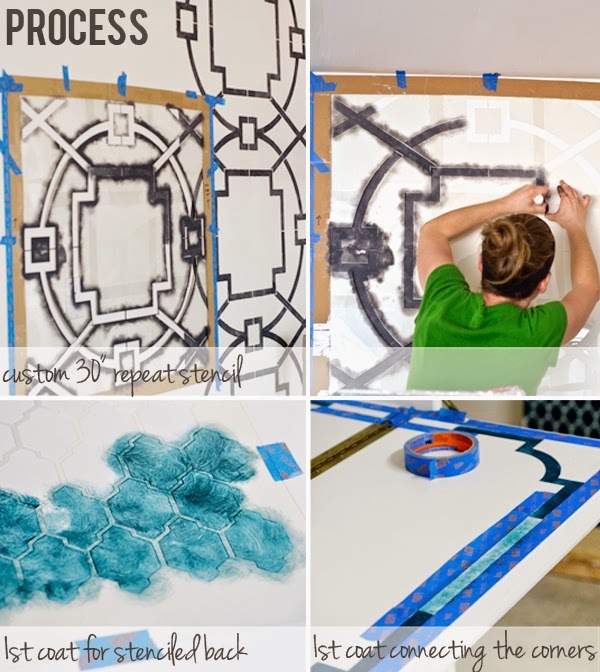 You can use about an inch in diameter stencil brush to complete the process as well. This can allow for a less uniform look as opposed to a roller. I also can only believe that it is much more time consuming as well. Don't get me wrong the look is very cool. And I bet the stencil is easier to clean. Back to the living room. Now the stencil is made to over lap in order to keep the pattern on track, as you can see from the picture below. This makes repositioning the stencil very fast and easy. When you move to the next full pattern there is still an overlap. As for the same process for top and bottom. From there you just keep moving along the wall. I would go one of the left, then one on the right as to let the most recent section dry. So after you keep going, and going, and going your almost done! In the photo above you can see the little white lines in the pattern when the stencil had to have supports to hold the pattern together. I choose to fill them in by hand after it was completed. I used a 1 inch foam brush (the kind the pointed knife edge) it was the perfect width to fill in the lines. Ta-Da! It's done! Awesome if I do say so my self! Never mind all of the junk all over the room, its a little bit of a hot mess right now. Hopefully sooner than later, I can post the finished redo. That would just mean I have to finish it, which I HOPE to by the end of the weekend...or next.